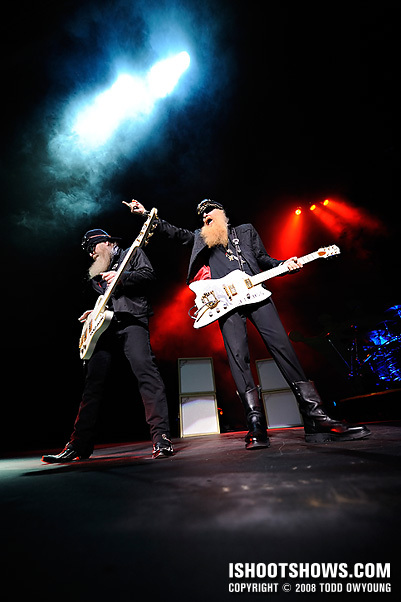 Billy Gibbons and Dusty Hill led the attack at the front of the stage, sporting their trademark sunglasses, chest-length beards and matching outfits. 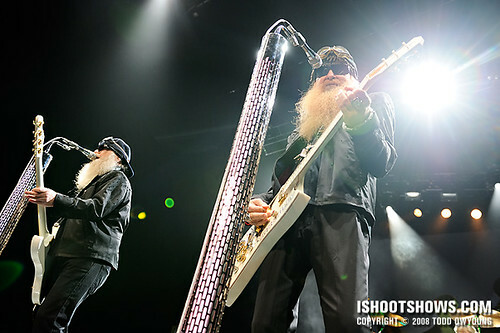 The pair traded vocal duties at two custom chrome mic stands, and often mirrored each other's movements on stage during the instrumental segments. 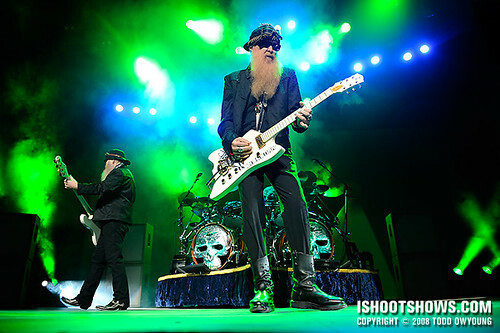 Seated behind a massive kit emblazoned with metal skulls, Frank Beard dropped the pummelfest of the band's bluesy, hard-rocking sound. 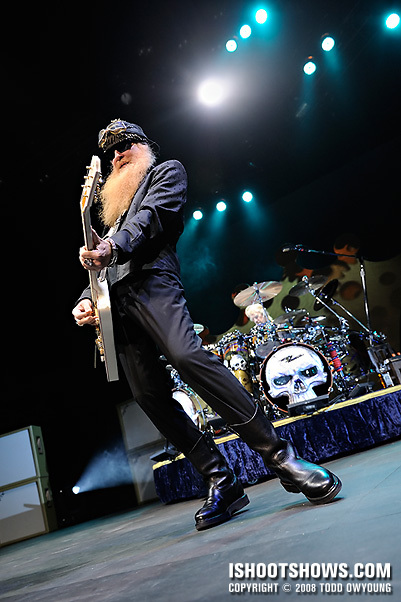 With almost four decades under their collective belts, I was expecting a big, blaring rock show, and ZZ Top did not disappoint. The press were granted two songs for this performance, and the end of the second song seemed to come all too soon. I shot this from the pit with four other photographers. Overall, the band's set saw some great lighting effects, and I've come to expect nothing less from the Fabulous Fox. The tours the venue books almost always come packing a great production. I photographed this set using the Nikon D3, D700, and my three go-to zooms: the Nikon 14-24mm, 24-70mm, and 70-200mm. 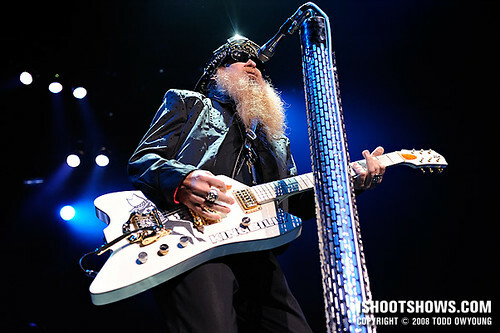 I have to say, ZZ Top was a thrill to photograph. If they're coming to a venue near you, I would highly recommend you check them out. Next ArticleAre you on Twitter? They sure show a lot of current bands how to get a good lighting design on!!! Hey Joel, thanks! The lighting was pretty nice, especially for the first song. I shot around ISO 800, f/4, and 1/500. The lighting for the second song was closer more around ISO 1600, but still nice. Hey Celso, thanks for the comment, nice to hear from you. These guys were a blast to photograph, and the whole vibe of the show was just plain fun. 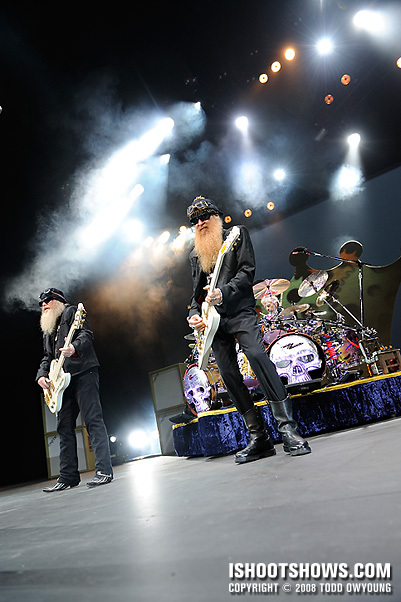 Hey Eric, Frank Beard’s drumkit was massive. Not the most ridiculous thing I’ve seen – that honor might go to The Rev of Avenged Sevenfold — but pretty sweet. Though not the biggest, definitely one of the cooler kits I’ve seen. Chrome skulls on the bass drums are a nice touch. Hi Horace – the D700 and D3 are essentially identical for my needs. I process the files in the same manner and never give any mind to which camera produced which file. Color, contrast,and noise characteristics are essentially the same between the cameras. This identical imaging platform was the main reason I went with the D700 over the D300 as a secondary camera. I saw these guys earlier this year and the show was killer. Reverend Willie G and the boys know a thing or two about grabbin’ the slab and grinding a pound. The shots do justice as always. Jason, thanks for the comment. These guys definitely could teach some masters courses at the school of rock. I would like to buy a set of the photos from the 9/30/08 St Louis, MO. FOX show. I sat 4th row on the side and would love to have a proof set of the show. 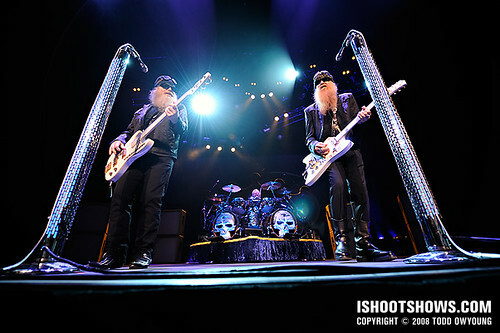 I have seen zz top 35 time and I like to get really good photos of them. I have a couple thousand of photos I have taken over the past 30 years. Hey Larry, glad to hear you enjoy the shots, it sounds like you had a great seat for the fireworks last night. I’m sure you have quite a collection of your own photos! Wow these are amazing… you totally killed the 2 songs, the lighting is so cool. Probably the sickest drumset ever. Hi Jessie, thanks! The two songs we had went by so quickly, I would have loved to photograph the whole set. 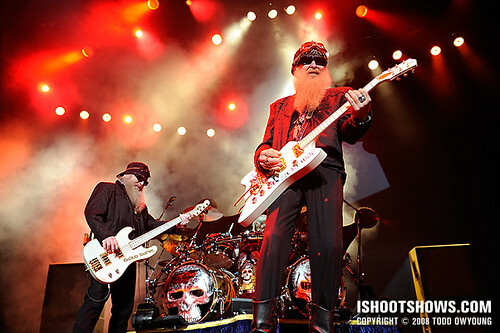 Frank Beard was pretty tough to shoot behind all those pieces of kit, though Billy and Dusty made it easy for me at the front of the stage. Add me to the list of those offering praise for this set, Todd! One of the best I’ve seen yet! Thanks, Keath. Glad to hear you enjoy this one. Todd, these are incredible. That skull drum set is out of control. Very nice Todd. Seeing them tonight in KC. Jamming on they’re tones right now!!!! You’re in for a great show, John – but you don’t me to tell you that. Thanks for the comment. Todd, you blow me away. I absolutely love everything you do, and this is my favorite set by far. Please, for the sake of all that is holy, write a book, and I will buy it. I must know your secrets. Hi Nathan, thanks very much for the kind words. I had no idea this set of images would generate such a response. Todd, this is one iconic set of photos. Your work never ceases to amaze me. Hey Tom, thanks very much, I appreciate it. Killer pics! The St. Louis Post-Dispatch is stating this was the set list. Who’s right? The band listed “Waitin’ For The Bus” and “Jesus Just Left Chicago” as two separate songs, but played them back to back without pause. With the two-song limit, the photographers were pulled just as the vocals for “Jesus Just Left Chicago” were starting up. The post set list is almost correct. 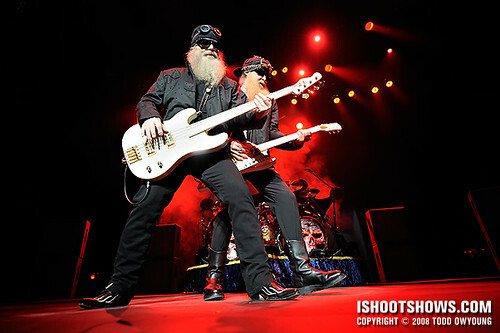 ZZ Top has played a combo song called La Grange/sloopy drunk/Bar-B-Q this then leads into Tush. They have played this the last 7 times I’ve seen them. I think 2 trains is correct I thought it was catfish blues but I may be wrong. Hey Larry, thanks for the input, I’ll update the set list posted. I appreciate the info! Hey Didier, thanks for your pick! 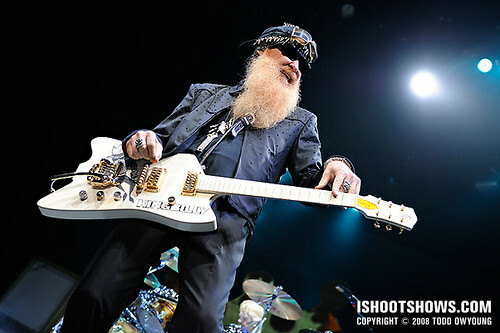 Billy was great to photograph, as was Dusty. Both really made a great show at the front of the stage. Very nice, younger I used to be fan of this band. They introduced be to real blues music. by the way Todd, do you have a deviantART account ? 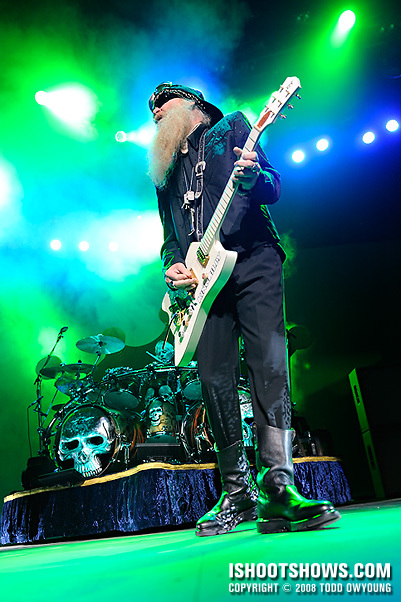 I posted a comment on ZZ TOP Forum to send fans your way. If you want to sell a set of the prints get back with me. 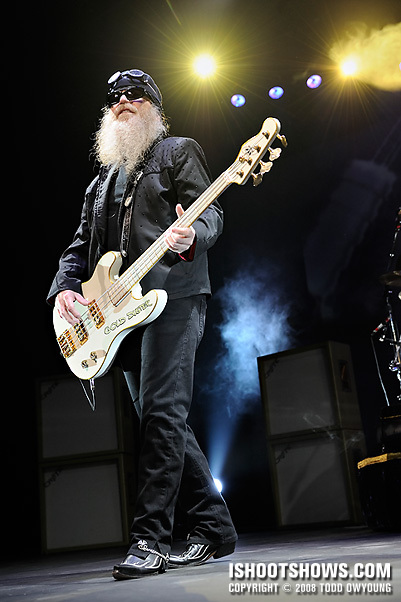 If you got to the zz top’s web site I posted a bunch of stuff on there. Thanks for spreading the word, Larry. Glad to hear you enjoyed the images enough to share them with other fans. i would give a leg for ISO 800 at 1/500 at f/anything. of course you get the amazing lighting when i’m not there haha. that guy’s drum kit is insane. Ha, the lighting at the Fox almost never disappoints me. The acts they book (or that choose to play there) almost always have either great lights or spotlights. Sometimes both. The lighting isn’t always the most interesting, but it’s generally bright enough for ISO 1600 as the max with generous shutter speeds and enough headroom to stop down. Photogs for my date were allowed to shoot from the front of the stage. It’s important to note that at the Fox Theatre where this show was held, there is no proper photo pit and barricade. What we did have was access to the very narrow gap in between the stage and first row of the orchestra pit eating, and the main aisles leading to the stage. The space at the front of the stage in front of the first row of seats was very tight, and I shot from the aisle for much of the first two songs. Thanks for your comment, it’s always interesting to hear how shows differ venue to venue. It’s great that you got to photograph the band twice this summer! I greatly enjoy reading the blog, and looking at your pictures. I’m currently trying to get photo passes for Death Cab, as well as Smashing Pumpkins at the Fox, though the woman for DC is impossible to reach lol. My question is, how would you recommend shooting at the Fox? is the setup always as tight as you described? Hey Bruce, the Fox has always had seating in the orchestra pit with very narrow clearance for the front of the stage. The seating is very slightly bowed, such that the gap to the stage is widest at the center and greatly tappers off at the sides. Overall, shooting at the Fox is much more restrictive than a normal venue with a normal photo pit. The positives are that the lighting is generally very good and that the stage is only about two and a half or three feet tall. Glad to hear you enjoy the blog, thanks for the comment! Dude. These guys look like 2 characters I would really enjoy meeting. Those beards are so dope! Picks: 2, 4, 5, 10, 15, 16. Really enjoy the wide angle of 2 [but not too wide] and seeing their custom chrome mics. Those stands are rockin! Really enjoy the vertical and him lurching forward effect of 4 [those skulls in 3 are so sick.. awesome drum stand]. Great spotlights in 5 and 10 — 9 really does show the synchronous movements you were talking about. Before I even read your post I thought they looked similar in movement in the photo… I love the angle of 15, but I think what attracts me more to it is that, “BAM!” of a blue cloud in the left corner of the photo — so smooth and such a cool effect. So yeah, I really love 4, 10, and 15. Hey Chris, thanks for your comment. Billy and Dusty really were a bunch of characters, and a great pair to photograph. 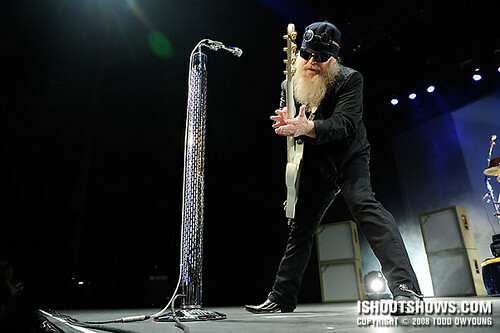 Their mic stands were pretty slick, which, along with the drum kit, made for some very nice custom pieces for the band. The lights were definitely a great bonus, especially for the first song. Thanks for the picks! Wow Todd. These are absolutely fantastic!! Were you able to get all these shots in just the two song period? Or do you continue shooting through the set (just further back in the venue)? Hey Red, thanks for the comment. I shot all these images during the first two songs, as that was the only allotted time for photography. One or two more songs would have been fantastic, though! 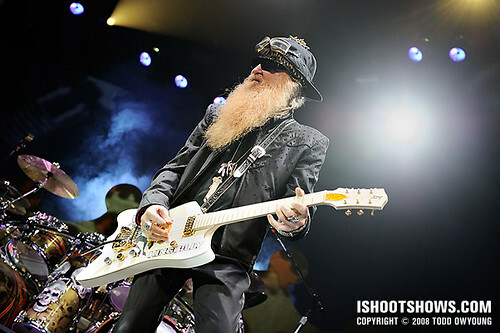 Todd, once again, some great photos. Were you shooting for a publication, or just for your website/portfolio? Hey Tim, thanks. I was on assignment for this gig. just got my photo credentials confirmed for DCFC and Fleet Foxes as well, question though, around what time do bands normally get there lists in at the fox? I know at the Pageant its about an hour before doors, is it about the same there? 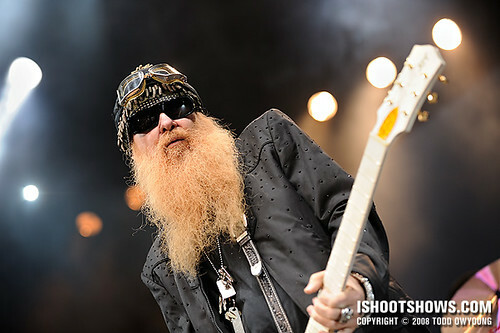 I went to the Houston Livestock show and Rodeo yesterday, and was searching Flickr for some photos of ZZ Top for a blog post I am writing. I found my way here through your link. Your photos are aMAzing! 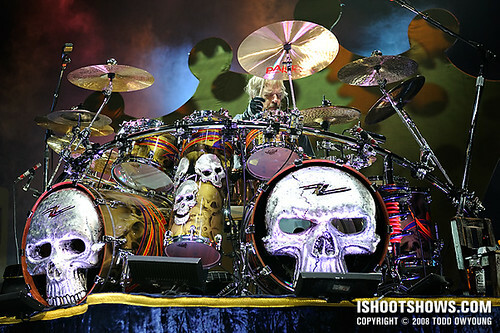 May I post the pic of Frank Beard’s drum kit to my blog with a link back to yours? Posting the shot of the drum kit on your Blogspot with a link back here is fine, glad to hear you like the images. Thanks, Katdish. excellent shots, todd! they’re certainly a good (and fun) band. Thanks – yup, they’re a great band to see and photograph, I was impressed by the show.